I don’t know about you, but I have found it incredibly difficult to get into the Christmas spirit this year. I’m going with the fact I broke my own little tradition and didn’t watch The Muppet Christmas Carol and write my Christmas cards on December 1 like I normally do as my excuse. And since then, despite drinks in the office, countless dinners with friends, family, work colleagues and the other half, making dozens of Christmas decorations and stringing lights with Frozen in the background, I still haven’t felt very Christmassy. This wouldn’t be so bad if I was an organised person, who just gets on with present buying and card writing, but I am deeply concerned this may be the year I need to brave Union Square on Christmas Eve. As the years have passed though, I’ve tried to personalise and give thoughtful gifts that will be appreciated rather than generic rubbish that end up on eBay or gathering dust. I really believe that the effort put into handmade gifts, whether they be tiny decorations, a bottle of infused vodka or a stack of tiny shortbread mean more than any gift grabbed at the last minute. This year I haven’t made as much as I have in previous years on account of my less than festive demeanour and the fact that painting, glittering and hot glue gunning 40 pine cones for decorations for four hours can be pretty exhausting. 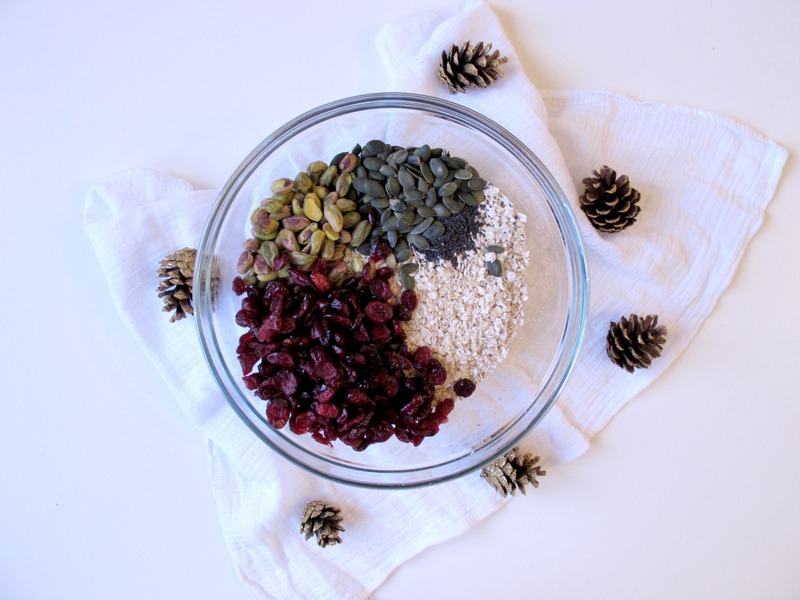 Which is why this granola is so great as a gift – it’s festive, fairly healthy and what’s more, incredibly easy to make. 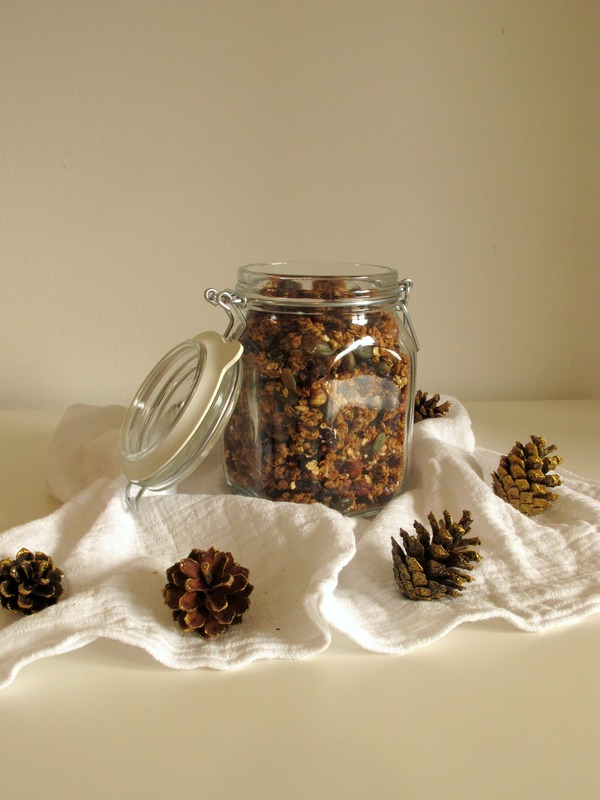 At a time of excess, a gift like Christmassy granola will have the recipient reminiscing about the festive smells of cinnamon, orange and sweet cranberries when they open the jar one dreary January day for breakfast. 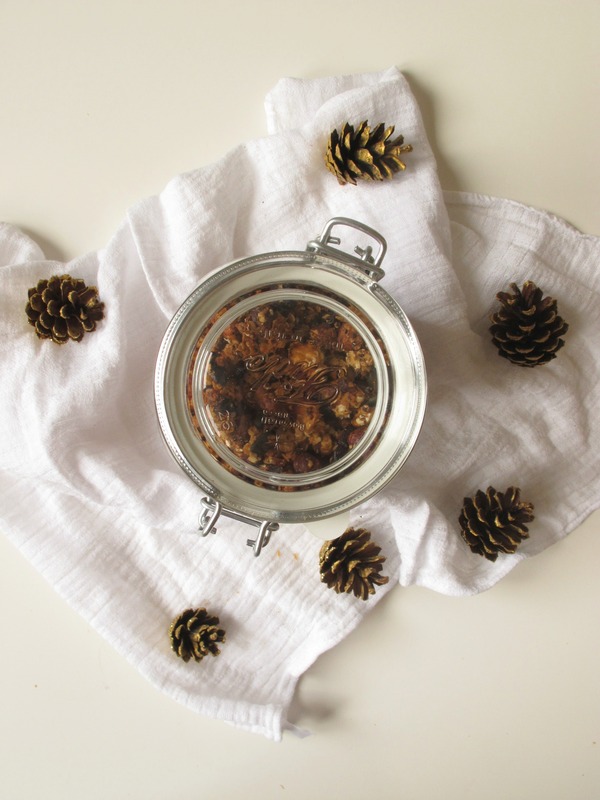 Perfect with almond milk, Greek yoghurt or just as a snack, it’s quite an unusual and unexpected homemade gift for someone who may be expecting another soap set. Plus, it’s a festive bonus for any Grinches, as the perfume that permeates your kitchen as it bakes is simply extraordinary. I won’t lie – I was dancing and singing to Uptown Funk surrounded by the smell of Christmas as it baked. 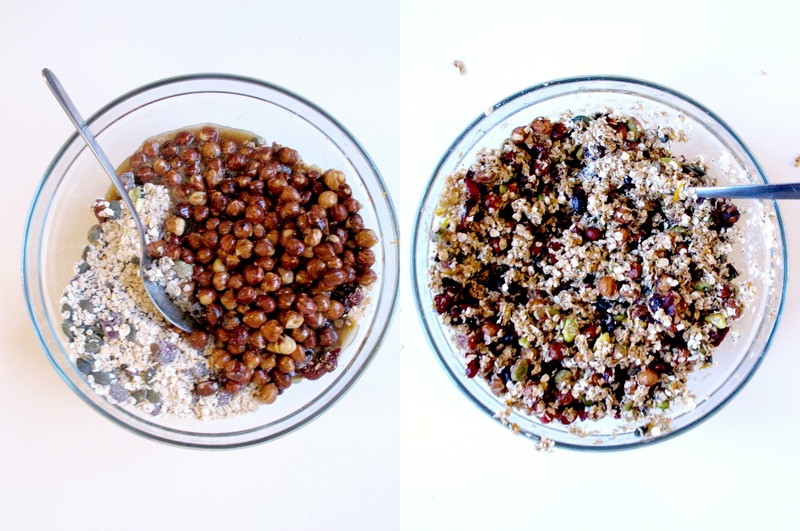 This is a fairly straightforward riff on my Caramelised Almond, Apricot and Pistachio Granola with a few festive tweaks that can be made, baked, cooled and jarred in under an hour. Tiny hazelnuts are tossed in butter, brown sugar and honey until caramelised and stirred with a good helping of cranberries, a fragrant zing of orange and sweet spices before baking. Store in a glass jar, tie with ribbon and place in a gift bag. It’s like giving the gift of the Christmas spirit in a jar – without having to brave the shopping mall masses. Preheat the oven to 170oc/150oc fan and line a large baking sheet with baking parchment. Over a low heat, melt the butter in a frying pan and once crackling, add the hazelnuts, stirring to coat. Stir occasionally for around five minutes until the nuts are fragrant then turn the heat to low and stir in the sugar and honey. Stir to combine until the sugar dissolves then remove from the heat. 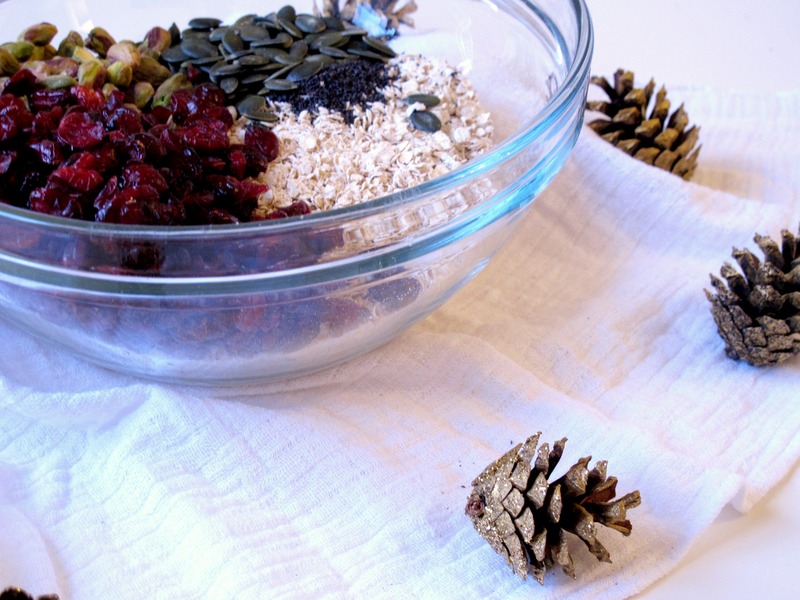 In a large bowl, combine the remaining ingredients and add the caramelised hazelnuts, stirring to ensure the oats are all coated – you can do this by hand if the mix has cooled slightly. Tip onto the baking sheet and spread in one even layer. 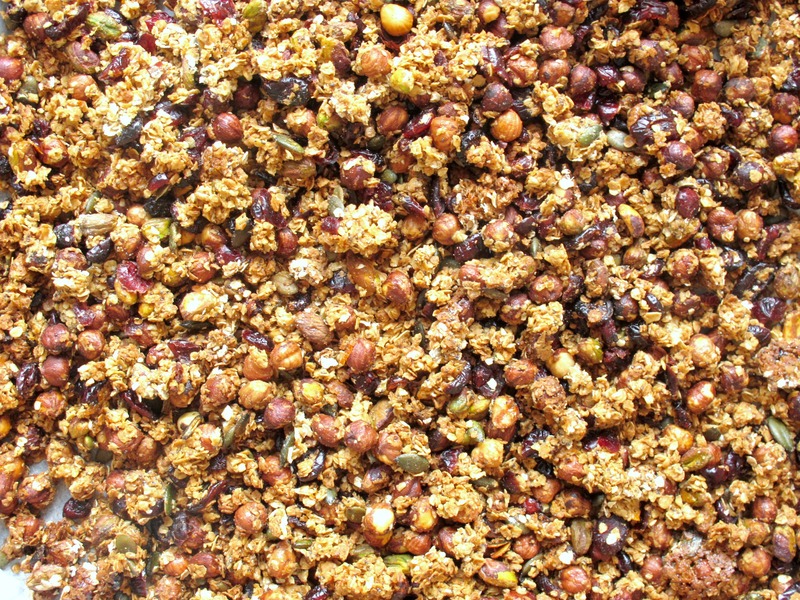 Bake in the oven for 15 minutes, removing to stir the granola then baking for a further ten minutes until golden. Remove from the oven and leave to cool in the tray then transfer to an airtight container.